Westside lunchtime and evening meeting have moved to new room at Room 7 upstairs at Resource Centre in Westside. Tír na nÓg (Big Book) has changed to Monday evenings at 8pm. This meeting focuses as a Young People’s Meeting. Young has been defined as anyone who has room to grow. Guided by Tradition 3, and open to all who suffer from alcoholism. We are NOT affiliated with any of these accommodation contacts. We offer these contacts in good faith and accept no responsibility for any service you purchase from them. Let visitors and members know of changes to your meetings. Don’t forget to REFRESH your browser, because information changing, if you’ve been here before. Loughrea groups would like to inform you of the meeting changes during the Christmas. NOTE: Please be aware that these changes are provided by each group and we post these as we receive them. Please check with the meeting secretary to get 100% clarification. This entry was posted in Announcements, Meeting News on by admin. You are invited to come along and enjoy a weekend and opportunity to meet socially and celebrate sobriety. 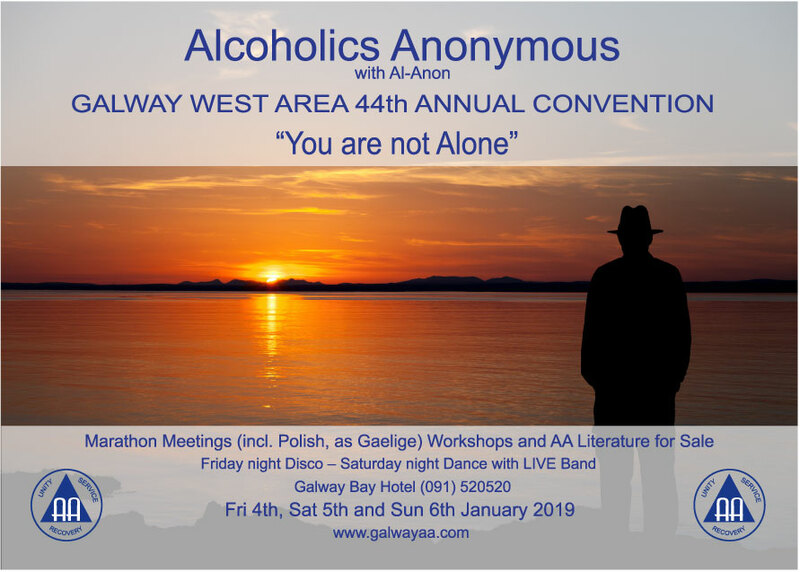 Please find below the programme for a very full weekend for members of Alcoholics Anonymous. Wishing you a great convention. Don’t forget to REFRESH your browser, if you’ve been here before. Information that you provide to us for the purpose of registering with us (including your name, address, contact number and email address). We may use both “session” cookies and “persistent” cookies on the website. We will use the session cookies to: keep track of your visits whilst you navigate the website. We may use the persistent cookies to: enable our website to recognise you when you visit. When using standard web browser settings, the session cookies will be deleted from your computer when you close your browser. Persistent cookies will remain stored on your computer until deleted, or until they reach a specified expiry date. Send to you information requested by you, via the website, and supply to you services via the website. Send you general (non-marketing) communications. Send to you our newsletter and other communications relating to our business (you can inform us at any time if you no longer require communications). Provide third parties with statistical information about our users via Google Analytics – but this information will not be used to identify any individual user. You may instruct us not to process your personal information for any purposes by email at any time. In practice, you will usually either expressly agree in advance to our use of your personal information for any purposes, or we will provide you with an opportunity to opt-out of the use of your personal information for marketing purposes. Where our website contains links to other websites, concerning Alcoholics Anonymous, we are not responsible for the privacy policies or practices of third party websites. The data controller responsible in respect of the information collected on this website is galwayaa.